New Release 1.2 for Tally 9 is here containing many modifications and corrections. Finally Tally has come up with next release of its version Tally 9. The release has come p with many corrections and modifications. The most important one is of Excise duty. The correct calculation of Secondary Education Cess can be displayed in Excise invoices. Although this correction was much awaited but any way better late then never! The Secondry Education Cess which was not calculated correctly in previous release has been corrected. Now One percent secondry Education Cess is calculated on Excise duty earlier this was calculated on just previous duty in the Invoice. 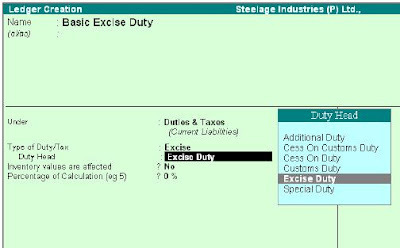 The Ledger Excise Duty has to be made under duties and taxes and select type of Duty as excise Duty. Same way Education Cess and Secondry Education Cess Ledgers have to be made in similar manner but Duty Head would be Cess on Duty. There are other major corrections also which includes calculation of CVD(on Import) , VAT declaration in Excise VAT Invoices ans separate duty heads for custom and excise duties etc. Check out the detail release notes of Release 1.2. You need to download the stat version 53 also for updated Statutory reports. These updates include various statutory changes for different states and countries. State 53 release note are also available on site as well as on ApniTally. Tally 9 Rel 1.2 is available here for download.